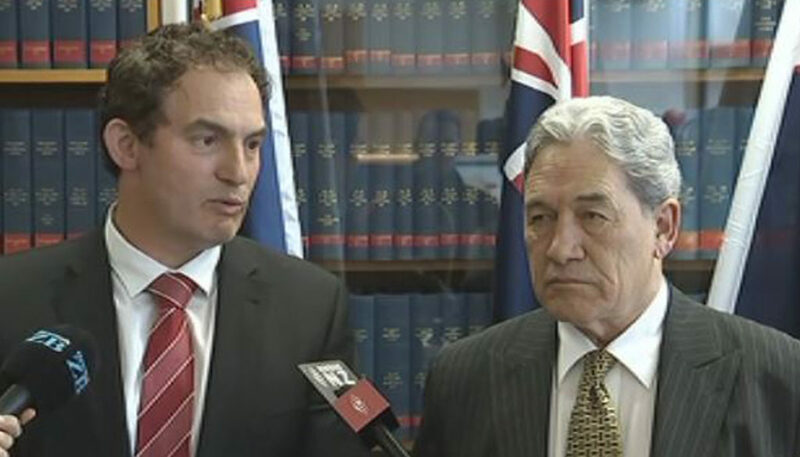 A year before the 2017 general elections, New Zealand First leader Winston Peters pledged to add an extra 1,800 police officers if elected into government. It was reminiscent of his Party’s win the last time they were in power from 2005-2008, when 1,000 officers were recruited into the force as part of their Coalition Agreement with Helen Clark’s Labour. 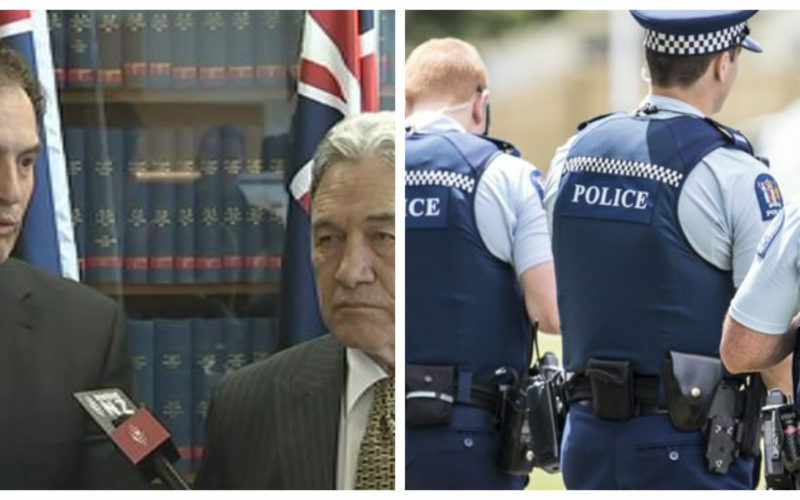 Now, during NZ First’s second stint working with the NZ Labour Party, they have secured funding to bolster the country’s law enforcement authority once again. In an announcement by the Deputy Prime Minister Peters and Minister for Police Hon. Stuart Nash, the 1,800 officers promised by the former will come into fruition. An almost $300 million cash injection from #Budget2018 means NZ Police can secure more front-line police officers for the next three years. Of the 1,800 new recruits, 1,280 will be deployed around the different police districts in the country while 520 will be trained to specialize in tackling organized crime as investigators and technical specialists. 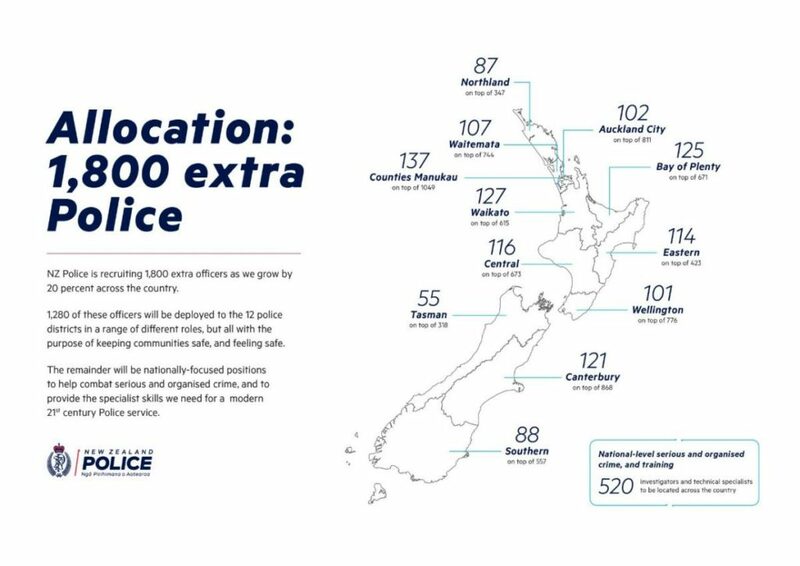 The biggest increase of police numbers will still be in the Auckland Region, with Counties Manukau Police District receiving funding to add 137 new cops. But especially noteworthy are the large additions to the Manawatu-Wanganui (116) and the Bay of Plenty (125) regions which are not far-off from Counties Manukau’s added numbers. This is evidence this current government’s commitment to improving the lives of regional New Zealanders. Naturally, challenges emerge as the Government needs to find people who can be recruited to fill these new positions. The policing community once labelled the plan to add 1,800 new police officers in three years as “ambitious”, but Minister Nash expressed confidence it was doable. During the last Labour-NZ First police force injection, the Government had to source many of the new recruits from Singapore. With a high domestic unemployment rate, this should not be an option in the current recruitment process. The Police Minister has signaled an aggressive domestic recruitment drive. In late 2017, a viral video by the NZ Police attracted 1,000 applications to join the force within a week of its release – more than double the 520 applications it normally receives per month. Also, part of the $300 million funding package is to train 12 new full-time positions at the Royal New Zealand Police College to train new officers and upskill existing ones. With these guarantees, we can be confident the Government can deliver on these announced numbers. Accomplishing this would signal the single-largest investment in the Police in the country’s history, as well as record number of funding provided for regional policing. Above all, the move also represents another campaign promise fulfilled by both NZ First and the Labour Party – having already committed to their shared vision of having a $20 minimum wage by 2020 as well as reforming the educational system. Ditching plastic bags — at last!